Murania Press » Battening Down The Hatches…. The last few weeks have been extremely chaotic for me, which is why I haven’t updated this blog much since returning from California earlier this month. Yesterday I moved from my home of the last 18 years after spending two frenzied weeks packing up my collection and carting it to storage. My condo, which had been on the market since the spring, finally sold and the closing is scheduled for tomorrow. Yeahhhh, that’s not gonna happen. Turns out my current, temporary home — only ten miles from the condo — is right in the path of “Frankenstorm,” and everybody here is hunkered down for what appears to be a long and stressful siege. Although we should be able to withstand Hurricane Sandy without sustaining major damage, we’re concerned about flooding and possible extended power outage. As I write these words Sandy is scheduled to make landfall within a few hours. It’s a monster, that’s for sure. Not exactly what I need to deal with after finally completing the long-planned move to new digs. Nonetheless, I wanted to check in and assure everybody that the Murania mill will resume churning, one way or the other, sooner or later. I’ve got a whole bunch o’ books in progress and I still expect to get them to market in the weeks to come — certainly before year’s end. 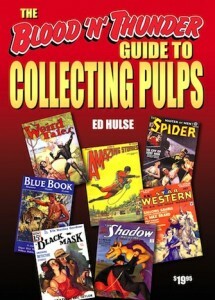 They include, in order of scheduled release, the Fall issues of Blood ‘n’ Thunder and Western Movie Roundup, the long-delayed Distressed Damsels and Masked Marauders (which recently cleared the legal hurdle placed before it some months ago), and The Best of Blood ‘n’ Thunder: Volume Two, the fourth volume in Murania’s Classic Pulp Reprints series (H. Bedford-Jones’s 1915 historical novel, The Wilderness Trail). Finally — and hopefully in time for Christmas — you can look forward to The Blood ‘n’ Thunder Guide to Pulp Fiction, the revised and greatly expanded second edition of what was originally published as The Blood ‘n’ Thunder Guide to Collecting Pulps. Editorial work on these books has been completed (barring whatever minor corrections are needed after proofreading), and I’m getting some layout assistance not only to speed things up but also to relieve the burden on Murania Art Director Chris Kalb. I’d hoped to be further along on these releases by now, but I severely underestimated the amount of time I’d need to pack and store the many thousands of books, DVDs, pulps, and magazines — not to mention additional effluvia — I’ve accumulated in the last two decades. Obviously, a prolonged power outage won’t help matters, but I’m keeping my fingers crossed that the worst doesn’t happen. And I hope the same for those of you who are also in Sandy’s path. I tend to believe your comment on Chandu being lifted from the Talbot Mundy novel you have in mind. The matchups are just too close for coincidence. I regret in my conversations with Walter Gibson that I never asked him what he thought of Chandu (the magician, not the opium). However, Walter did know the second husband of the woman Houdini called, “the greatest female mystifier”, Anna Eva Fay, and he provided me some stories that I used in my 2005 biography of Annie called The Indescribable Phenomenon from Hermetic Press. There was some movie interest, but nothing came of it, which is the case in 99 out of a hundred such situations. My latest book, The Thought Reader Craze, covers the almost desperate search by scientists in the period of 1870-1910 to prove that telepathy was a fact of human nature. The book also tells the story of the men, women and, occasionally, children who so successfully hoaxed the scientists, and the parallel story of the rise of the stage mindreading act first created in a Chicago saloon one Monday morning in 1873. In any case details are on my website. Enjoyed my first issue of BnT. Trust you came out of Sandy okay.